pollyeckert | Hungry for a genuine, fruitful life? Hungry for a genuine, fruitful life? We all get lemons sometime in life. Here’s a recipe for a new way to capitalize on a “sour situation” without using so much sugar. Peel two lemons and throw them in the blender (whole). Add 6 ounces of water and 12 ounces of ice. Add 6-10 basil leaves and 1/3 cup of sugar or sweetner to taste. I like stevia. Blend and enjoy. You can tweek this recipe to your own taste. The basil somehow eliminates the need for so much sugar that regular lemonade requires. 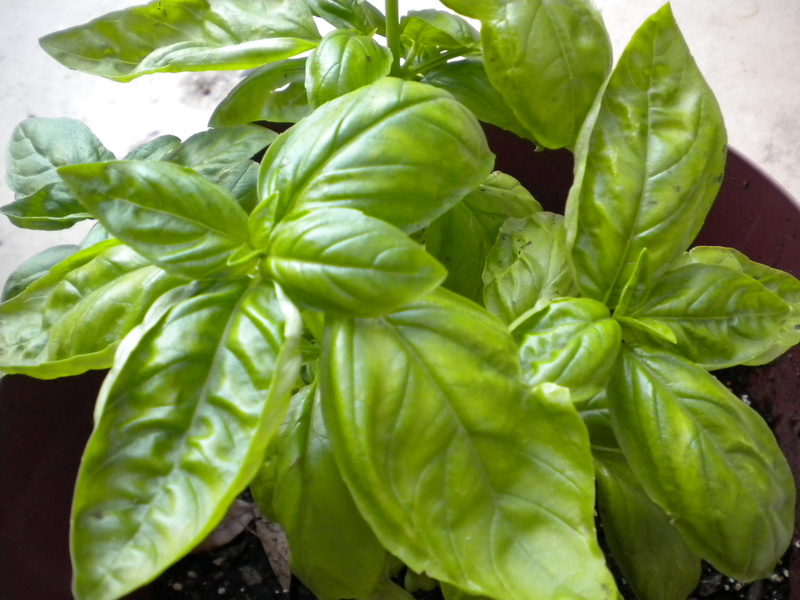 Basil is easy to grow in your landscaping or in a pot. It just needs some direct sun and water. See picture below. Have you seen people who are in a place of receiving a “lemon” in their life requiring way too much “sugar” to go with it? We can sense “the pull”… The pull wants us to “belly up” to their self-pity bar from which there is no escape! No good for them or us. But no sympathy is too uncaring, too preoccupied, and all kinds of hurtful. Some sugar (comfort) is a good thing. Some is necessary. But where is the “basil?” Where is that thing that will return the lemon down to it’s actual size when it has gotten out of hand and become a grapefruit? Personally, I’ve received great help from testimonies or true stories. The “lemonade-makers” of the past love to offer their success stories. The easy part is: often they are already in you. A job of the Holy Spirit of God is to bring all things to (your) mind. If you pause and ask God to bring something for this person to your mind, He will do it. Believe me, the strangest memories come popping up. Sometimes it is a memory of a mistake and the subsequent lesson I learned. Sometimes it is a friend’s similar story. Sometimes it is silence. By asking God into the situation, even silently, He “calibrates” the right amount of sugar needed and can place the focus on hope in the midst of the situation. I’m no expert. And there is a time for grieving. But often the best calibrater is silence with a caring touch on the arm or shoulder. I guess, God is the basil. Smile. Blend and enjoy. You can tweek this recipe to your own taste. The basil somehow eliminates the need for so much sugar that regular lemonade requires. Basil is easy to grow in your landscaping or in a pot. It just needs some direct sun and water. See picture above. Rub off the fuzz. Bite. The combination of tangy and sweet flavors plays harmony in your mouth. Juice runs down your arm. 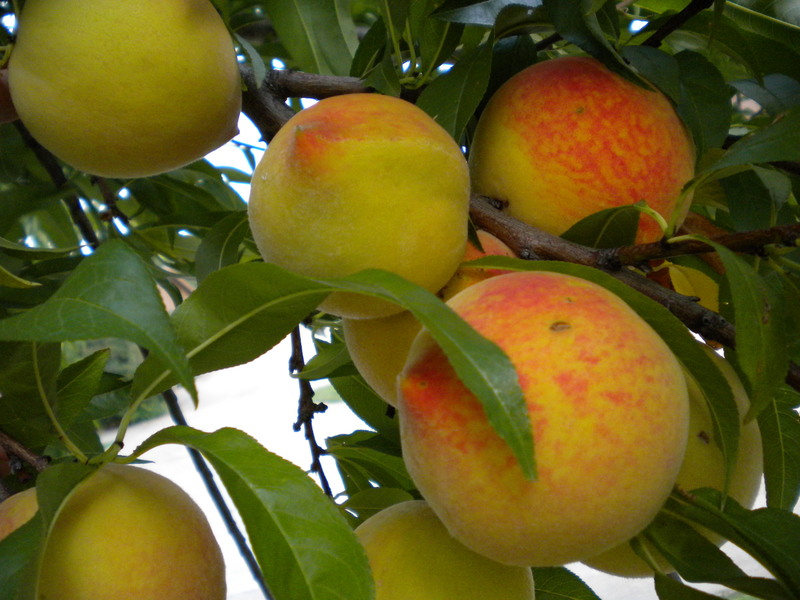 For a few weeks the sweet fruit swings in the tree and beckons me to enjoy. It is just steps away from our door. As I rise in the morning just steps away from becoming fully awake I sometimes hear a voice. Sometimes I wake with an impression of something I should do or not do. Is this my conscience? Is it God? Conscience can be wrong. It may have wrong information as its base or incomplete information. So follow it warily. God is never wrong. He wants to lead us by His Spirit. Jesus told some people to depart from Him because He never knew them. The implication was they never let Him know them. Follow His voice intentionally. If you think you might be hearing God’s voice, follow it warily and press in to what you heard or saw asking Him for confirmation. Compare it to what the Bible says. Honor Him by pursuing it as an invitation that He might know you better, and you might know Him. Over the course of several days, I asked Him a question many times and heard nothing. One day I was singing Him a song. He interupted me midsentence–or midlyric–and told me the answer to my plaguing question. I was so encouraged to have heard His answer. But the bigger answer was found in how He chose to answer me: the context of worship. Did I want the answer to my question more than I wanted Him? How about you? Do you hear God? How do you know it’s Him? You didn’t choose Me, I chose you. I appointed you to go and produce fruit that will last, so that the Father will give you whatever you ask for, using My name (John 15:16). Hello world! Hungry for life, anyone? Honestly, I am blogging because I want to reach the hungry. Have you ever woke up one morning and knew you had some kind of experience going on with the supernatural in your sleep? Life seems to bring people to me who have had an experience with the spiritual, supernatural side. Some have experienced God in this fascinating, personal way. But they never knew what it meant or what to do with it. Over time the experience faded and the door to that experience seemed to close. Others come away from church thinking, “Isn’t their supposed to be more than this?” The Bible describes a personal, supernatural God. In fact, Jesus told people to depart from Him because He never knew them. He wants to know us. You might say it is required for heaven. Then, there are the curious. They want sensible, honest answers to what the Bible says. People were transported, transfixed, and entranced. When appropriate, they dealt with demons. Our battle is not against flesh and blood. Can there be real, supernatural, unflakey life like that today? I’ve found a secret that helps–stay hungry. When I hear about your ‘meal’ or you hear about mine, that helps me to look into it and stay hungry. Why don’t you tell me about it? Have you ever had a supernatural experience with God? Do you want to? For my determined purpose is that I may know Him that I may progressively become more deeply and intimately acquainted with Him, perceiving and recognizing and understanding the wonders of His person… (Philippians 3:10 Amplified).